Digi-Schlock: GHOULIES/GHOULIES II (Scream Factory Blu-Ray) – Schlockmania! From time to time, Scream Factory dips into the catalog of Charles Band’s Empire Films. It’s a pretty rich source for ’80s popcorn horror, as Band was a prolific producer of genre-friendly cheap thrills during that decade. 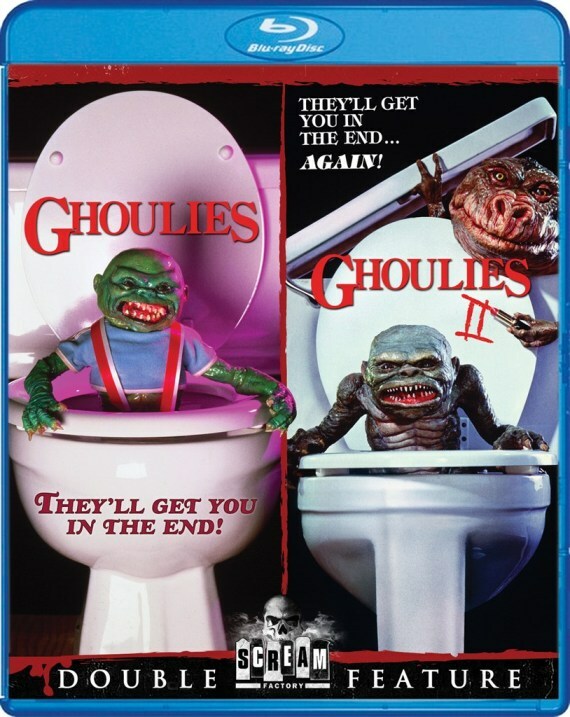 Most recently, Scream Factory has produced a two-for-one set of a pair of entries from one of his most successful film series, the Ghoulies films. Said disc pairs the first two installments on one disc and also throws in a bevy of extras. The transfer for Ghoulies is colorful but the details are a bit soft, particularly in long shots, and video grain can get a bit blocky during night shots and dark interiors. The Ghoulies II transfer is better, with stable black levels for the night scenes, vibrant colors and all-around solid details. Both 5.1 and 2.0 lossless tracks are offered for each title: the 5.1 mixes aren’t wildly eventful in terms of surround speaker activity but both offer a well-balanced blend of dialogue, effects and music. Both films are also treated to a nice complement of extras. There is a commentary track for the first Ghoulies by director Luca Bercovici. This solo track covers how Bercovici pitched and wrote the script to Band, the issue of whether or not it owes a debt to Gremlins and how John Buechler’s monster designs inspired the humor used with these creatures. There are periodic gaps of silence that suggest he could have used a moderator but Bercovici covers all the bases and it’s interesting to hear his perspective. There is also a featurette for Ghoulies entitled “From Toilets To Terror.” It runs 30 minutes and offers some interesting insights into the film and the history of Empire Pictures via interviews with Charles Band, composer Robert Band, star Michael Des Barres and FX man John Vulich. Charles Band is the key player here, telling great tales of setting up the film’s distribution (which made the future of Empire possible) and creating the controversial ad campaign. Des Barres adds a lot of wit with amusing observations about doing genre fare and provides a great closing quip. It’s brisk and informative: Empire fans will find it fascinating. The Ghoulies extras are a rounded out by a skillfully cut trailer that captures the film’s mixture of campy humor and monster thrills plus a 40 image still gallery with stills, poster art and some neat behind-the-scenes FX shots. The Ghoulies II part of the disc has more extras. The centerpiece is “More Toilets, More Terror,” a 17-minute featurette. Charles Band returns for this piece and joins FX man Gino Crognale and actors Donnie Jeffcoat and Kerry Remsen. There’s some fun production trivia about the film – most of it was shot on a huge soundstage and extras were Italian – plus fond memories of Empire’s production line approach. Crognale admits a lot of the puppets used in the film were refurbished while Jeffcoat and Remsen share fun memories of touring and eating well in Rome. The Ghoulies II extras are rounded out by a series of alternate scenes and some promo materials. The alternate scenes run just under three minutes and are essentially little bits of R-rated gore that were cut from the monster attack scenes. There is also a fun theatrical trailer that focuses on monsters and goofball humor while a 25-image still gallery serves up stills, one poster image and some promo pix, including a fun shot of director Albert Band with the titular puppet monsters. In short, this is a solid two-fer for fans despite the middling transfer for the first film. If you’re fascinated by the Charles Band career, this is a fun way to catch up on some its highlights while learning about the man. To read Schlockmania’s film review of Ghoulies, click here. To read Schlockmania’s film review of Ghoulies II, click here.